This genius sanity saving tip for grocery shopping with kids will change the way you grocery shop – forever! Grocery shopping with kids is never easy – but grocery shopping when you have ‘that kid’ will make you lose your ever-loving mind. If you have ‘that kid’ then you know exactly what I’m talking about. I bet you’re probably sitting there right now having vivid flashbacks of a time that you left in a sweat carrying your kicking and screaming toddler under your arm like a football, maybe the time you had to coax your 4 yr. old to come down off of the top of the water display, or my personal favorite – the time the four year old tried to climb up the side of the cart while his younger sister was strapped into the top nearly knocking them both over with the cart on top of them. I’ve been dreading grocery shopping with kids since 2006. As infants, my kids were the ones screaming in their car seat the entire time – looking back I should of known what I was getting myself into, I had ‘that kid’. As toddlers, they were the one flopping themselves on the floor for a meltdown while everyone looked on in disbelief. But, alas, a family needs to eat so grocery shopping must be done – even if it means taking ‘that kid’ along with you. Arrive at the store and convince the toddler that they will sit nicely in the cart and have a snack. We wipe our cart down with those sanitizing wipes, get the toddler in the cart and buckle the straps. I hand the tot her snack and off we go into the store. I start the trip off nice and calm, unfrazzled, with my list and pen in hand. Aisle by aisle we go for about 10 minutes when the toddler starts to get antsy – you see these aren’t the ones that can be strapped down for long, they must run, climb, and jump! 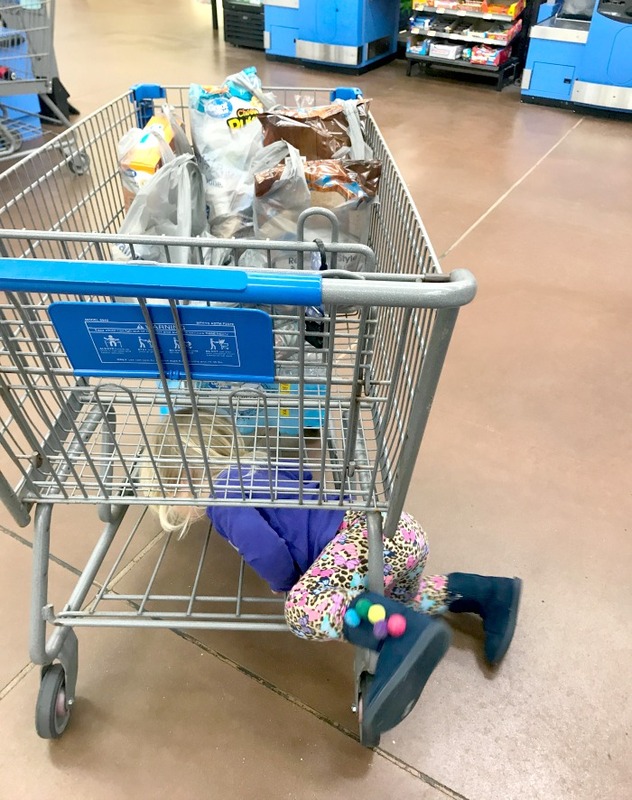 Within moments the snack is being dumped on the floor and the pint sized hoodini with limited fine motor skills is somehow unfastening the cart buckle and escaping over the seat to the back of the cart. My heart rate begins to raise and I now know we are working with limited time. I try to speed up and convince my child to sit in the back of the cart and finish her snack while I frantically dig through my bag to find some sort of grocery shopping entertainment that might keep her occupied longer than thirty seconds. At this point the list is long gone – who has time for that – and I’m grabbing whatever happens to be on an end cap that I can hopefully turn into a meal so we can get out of there! We HAVE to make it to the back of the store to get the milk though, which means I need the toddler to last just a little bit longer. Seriously why is the milk ALWAYS in the back of the store?! My little hoodini has hiked her leg up over the back of the cart and is scaling her way down the back side. FREE – she’s free – and I’m out of time!! My heart rate is somewhere near my max now and I’m in a full sweat – hey! on the bright side I’m getting my cardio in! 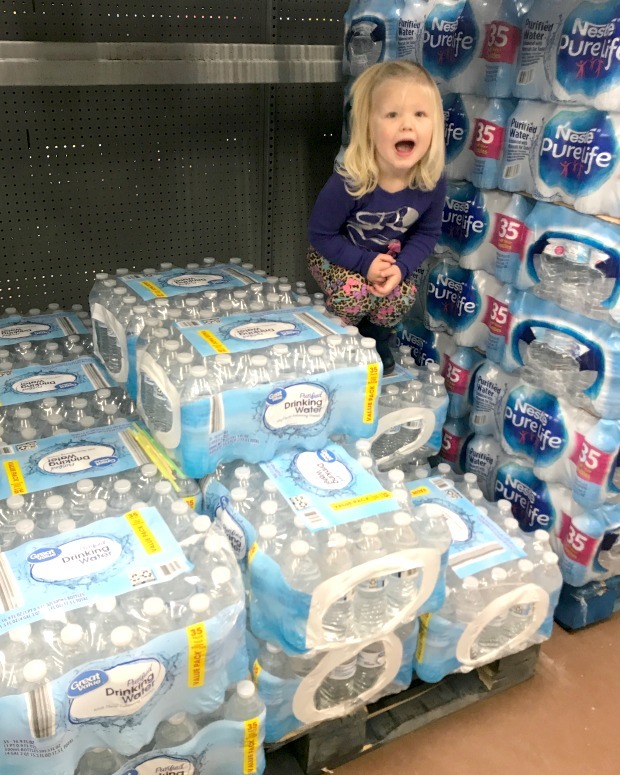 The toddler has made it to the top of the cases of water – they’re just SO fun to climb! After convincing her to move on we reach the milk and we’ve now grabbed what I hope is enough food to last a few days. As we make our way back to the check out I see the light – we are nearing the end of marathon and I’m re-energized knowing that I’ve almost made it to the finish. But no…there has to be a giant display of marshmallows sitting right there in our path and she spots them…cue MASSIVE MELTDOWN. This scenario has been playing on repeat for 10+ years! 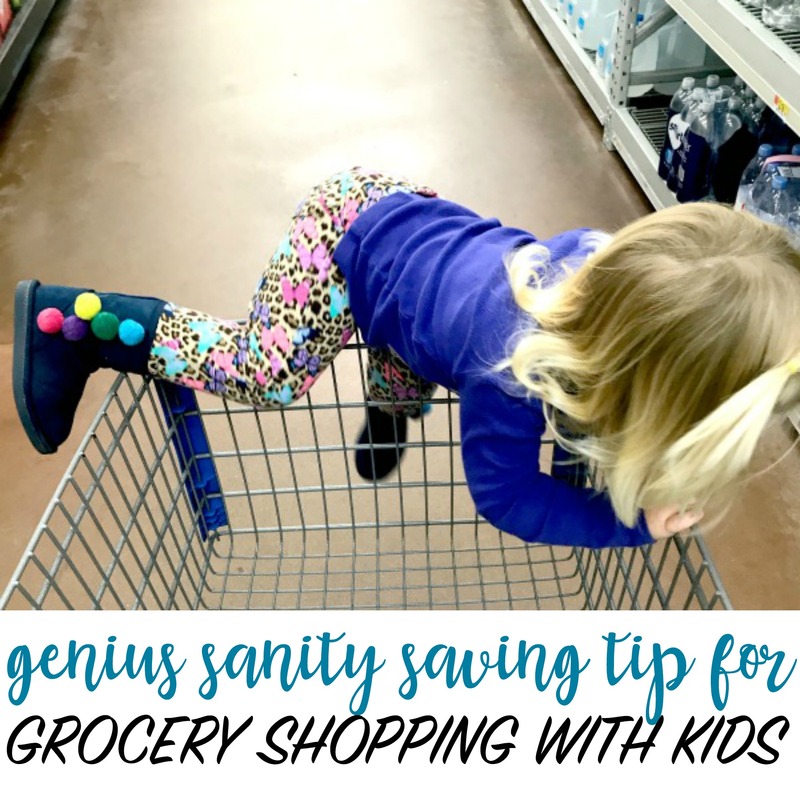 Grocery shopping with kids has been the same hassle for over a decade for me but I have finally found the secret – the genius sanity saving tip to grocery shopping with kids! I’m so happy that grocery stores have finally caught on that moms need help. One store in particular, Walmart. Forget the dreaded charade of dragging your child through the store kicking and screaming. It’s time to take grocery shopping to the next level and totally save your sanity – and time – in the process! My sanity saving tip for grocery shopping with kids?? Don’t do it!! 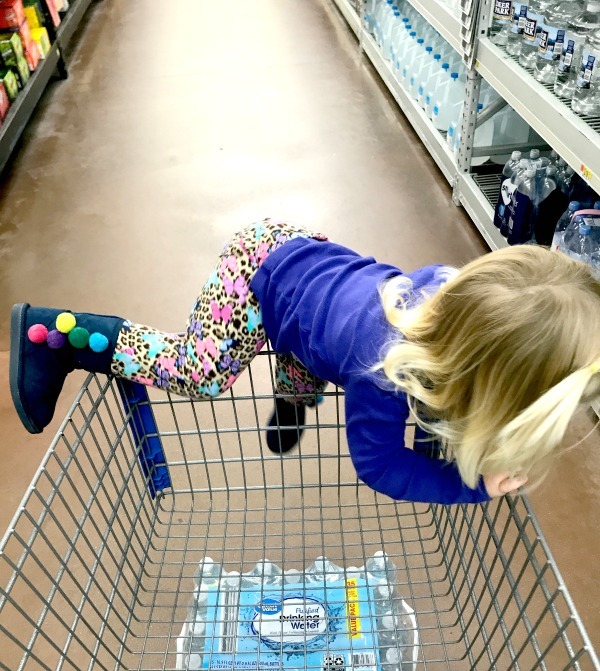 With Walmart’s online grocery pick-up you can avoid all of the stressful and embarrassing moments that happen when grocery shopping with kids! If you’re not going into the store – you save yourself the time and hassle. With Online Grocery Pickup, you order your groceries online and a personal shopper loads everything directly into your car when you get to your Walmart store. You – and most importantly your children – don’t even have to get out of the car. 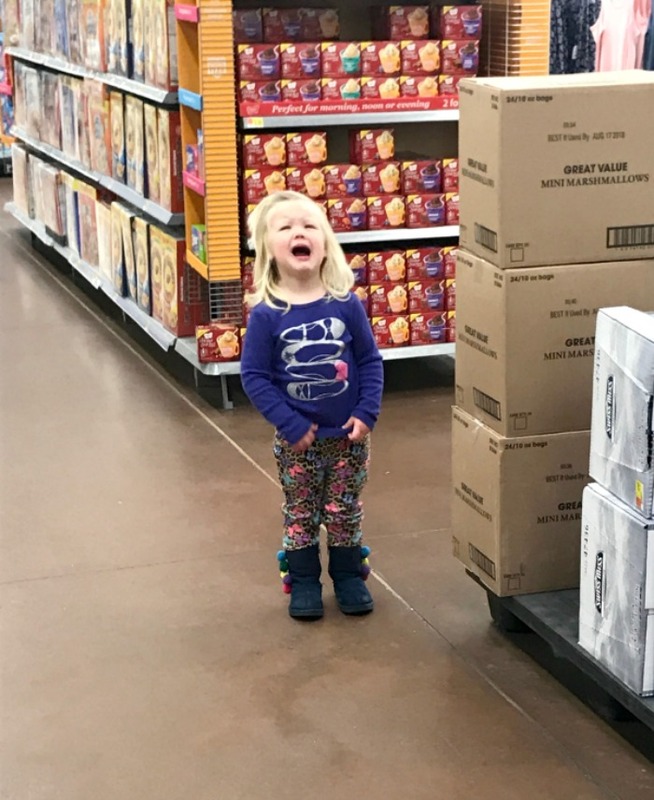 Walmart Online Grocery Pick-up saves you all that time and embarrassment that can happen when taking ‘that kid’ into the store with you. And even better – I can save you MONEY now too! I want you all to try out Walmart Online Grocery Pickup to see how amazing it is – first time users can use promo code WOWFRESH for $10 off – saving your sanity, your time, AND your money next time you need to do your grocery shopping!